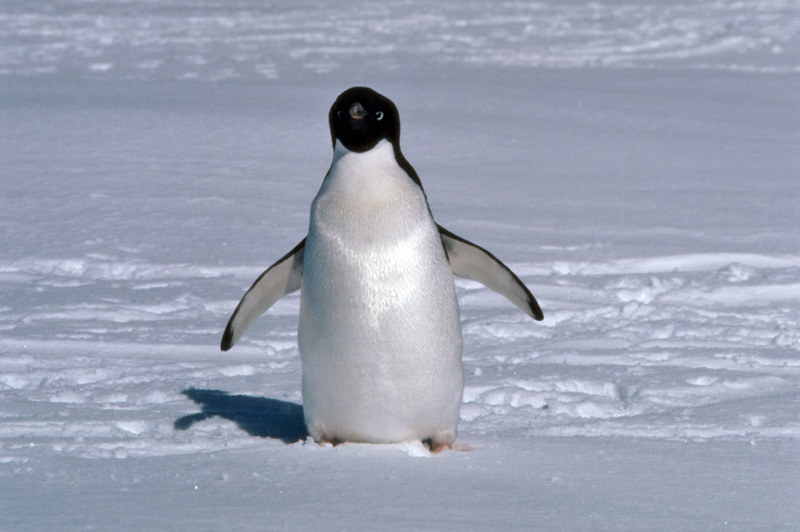 How are Adelie penguins adapted to survive in Antarctica? One of the "classic" penguin species, the second most southerly after the Emperor, Adelie penguins breed in the far south, but leave it to head north with the onset of winter. Anatomical - Structures of the body. Behavioural - The manner in which animals move and act. Physiological - The internal functions of the animal from biochemical, to cellular, tissue, organ and whole organism levels. Compact shape, low surface area to volume ratio reduces heat loss. 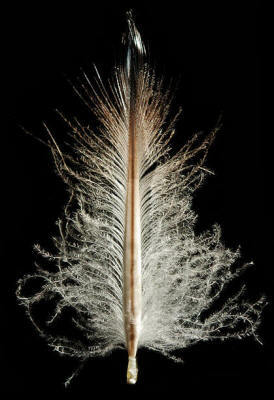 Very dense specialized feathers for insulation on land, a layer of fat under the skin provides insulation in the sea. Short wings reduced to flippers for swimming underwater, the musculature for those flippers is almost entirely held in the body where it can be maintained at a warm temperature more easily. Backward pointing barbs on the tongue to stop slippery prey escaping. Black above and white underneath makes it harder to see in the sea from underneath where predators wait. The colouration also helps in warming and cooling the penguin on land when they can turn the back or front to the sun according to whether they need to warm up or cool down. Migrate north to escape the harsh Antarctic winter at the end of the brief summer. Arrive in the south early in the summer season, to take best advantage of the seasonal abundance of food. Tobogganing sliding on their front while pushing with legs, saves a lot of energy in long journeys. Build a crude nest of stones to lift the eggs above ground level to prevent chilling from melting snow in summer. Gather at the ice edge in large groups before jumping in the sea in case of predators, this increases individual survival chances. Muscle has large amounts of myoglobin to hold extra oxygen that can be used with food to generate energy more efficiently during a dive. A circulation counter-current system in the legs and flippers mean that these regions are kept above freezing but below the normal body temperature, so reducing heat loss. 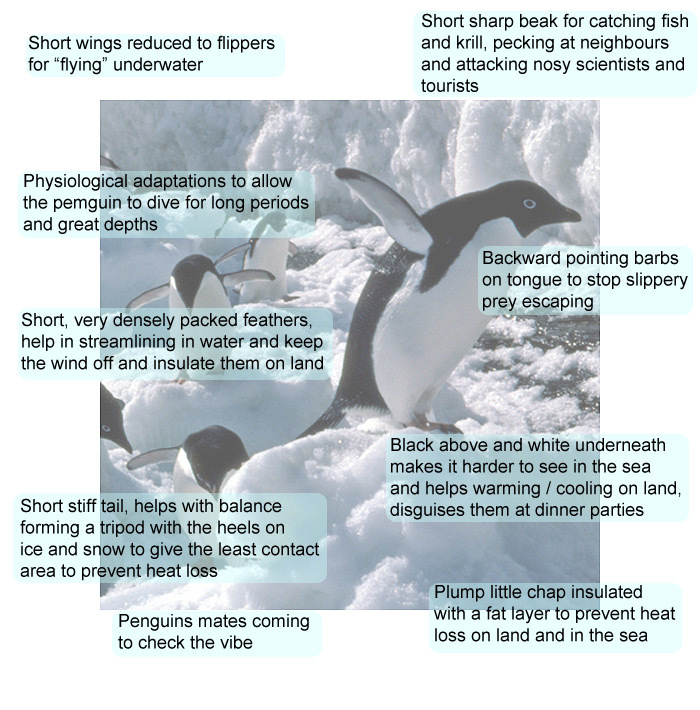 They are mainly operated by muscles kept warm in the penguins body via tendons. During a deep dive, the heart rate slows from 80-100 down to 20 beats per minute. Able to cope with a high saline diet due to salt glands and kidneys that produce concentrated urine (like many seabirds, penguins can drink sea water and gain water).